In my quest to combine various textures in dishes, this Poppy Seed Potato Gnocchi in Spinach Salad ticks all the boxes. 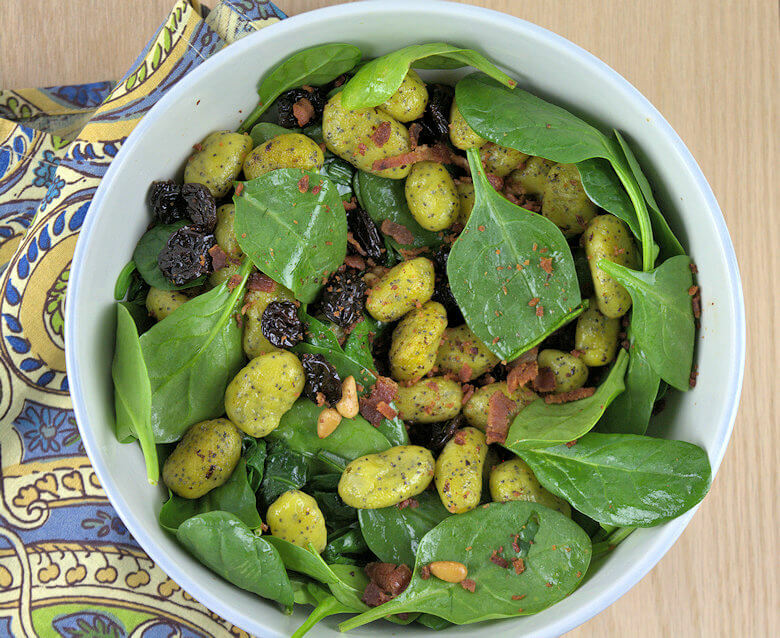 The gnocchi are served in a spinach salad with dry cherries, pine nuts and sprinkled with crispy bacon. Look at these little gnocchi. A yellow beet and poppy seeds transformed them, from a plain potato color, to vibrant yellow, speckled little pillows. A traditional potato gnocchi is rather bland in flavor; surely when well prepared, they are pillowy and tender, but flavor-wise they are not ‘outstanding’ in their field. That’s why most potato gnocchi dishes involve a sauce or baking. 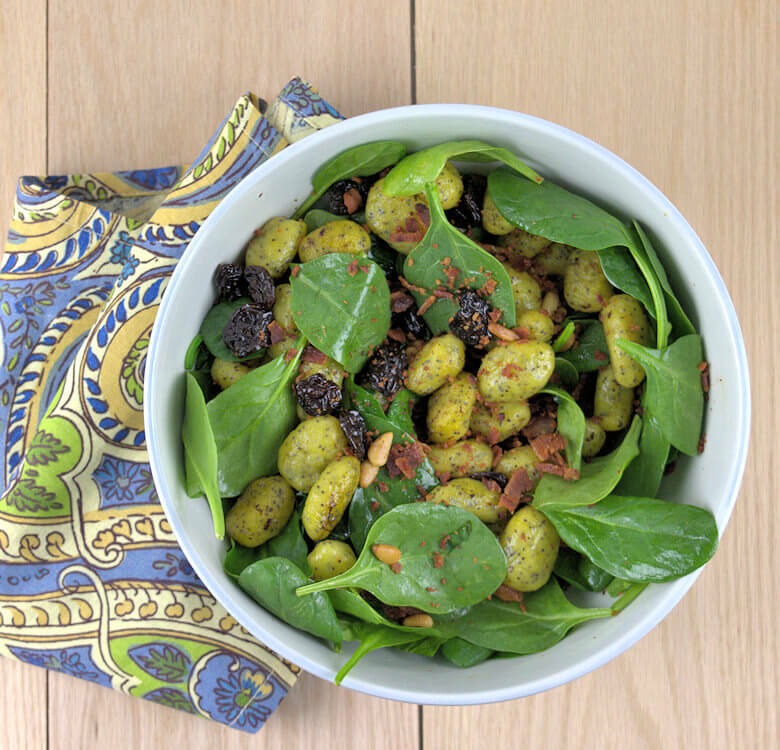 In this Poppy Seed Potato Gnocchi in Spinach Salad dish, the crunchy, but still tender, gnocchi finds company in raw and wilted spinach, dried cherries, crispy bacon and toasted pine nuts. Cook the beet and potato together, peel them and push them through a potato ricer for a lump-free mix. Once totally cooled, add flour, salt, pepper and poppy seeds and knead. Don’t add more flour than necessary, the less the better. To know whether your gnocchi will hold together, just make a test-run. Allow one small piece of dough to be the guinea pig and make it swim in boiling water. When it comes up for air and is still a well-formed gnocchi, you’re fine. If didn’t hold from, knead a little more flour into the mix. Now you know your gnocchi dough works, you’ll have to do a few things at the same time. Cook strips of bacon in a skillet until crisp. At the same time toast the pine nuts on a baking sheet in a cool oven that you’ll heat to 350 degrees F.
At the same time roll the potato dough into a rope of about max. 1/2 inch thick and cut the rope in small pieces of about 1/2-3/4 inch. Roll them into gnocchi. If you want to be fancy, roll each gnocchi along the tines (spikes) of a fork to get the traditional ridges, but you can do without as well (as I did). Place the gnocchi on a baking sheet with parchment paper. They should not touch each other as they will stick together. Boil water with salt, add the gnocchi and cook in portions, stirring once, until they float to the surface. This will take less a minute or so. Remove them immediately with a slotted spoon and transfer to another backing sheet with parchment paper. Transfer the bacon to a paper towel and add the gnocchi to the skillet, into the bacon fat. Cook on high temperature for a few minutes, so they get some of the bacon flavor. Now it is time to combine the elements. Half of the spinach goes into a salad bowl with the gnocchi, cherries and the pine nuts. The other half of the spinach goes into the skillet while it is still hot. Toss the spinach until it just starts to wilt. Partly raw and partly wilted spinach ties the entire salad nicely together; it is like the transition from raw to cooked. Empty the skillet into the salad bowl (spinach and juices); gently toss as you don’t want to damage the gnocchi and sprinkle with bacon. 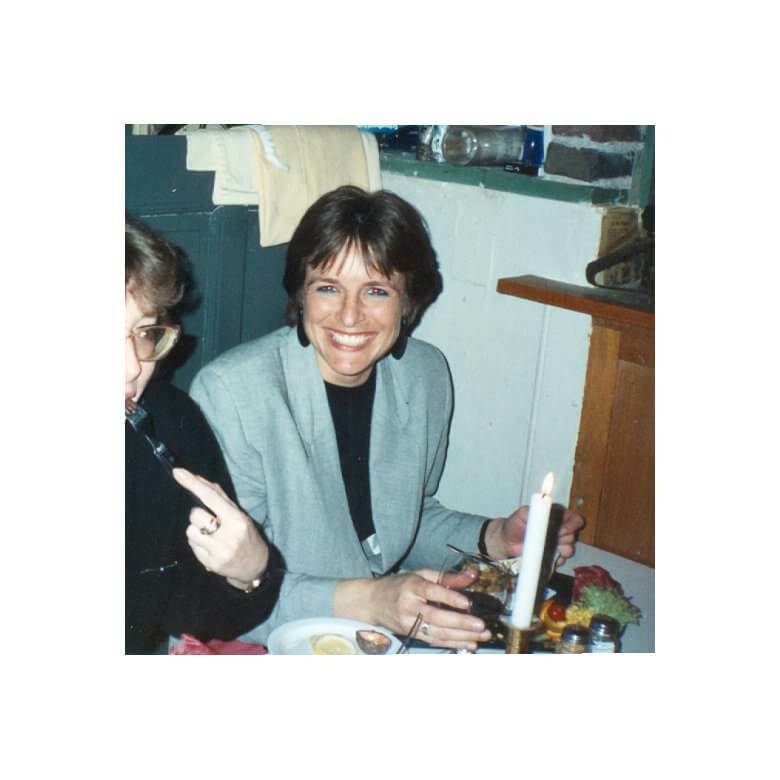 I don’t think there is any dressing necessary; there is enough flavor, enough variety in texture and temperature that a dressing is not needed. If you do think you need some, I would suggest a simple vinaigrette. This Poppy Seed Potato Gnocchi in Spinach Salad ticks all the texture boxes. The gnocchi are served in a spinach salad with dry cherries, pine nuts and sprinkled with crispy bacon. Cut the leaves off the beet and place it with the potato in a pan with water and salt and cook until tender. This will take about 20-30 minutes, depending on their size. No need to peel them. Toast the pine nuts, but spreading them on a baking sheet and place them in a cold oven. Heat the oven to 350 degrees F. Once the oven reached its temperature, turn it off and take the nuts out of the oven. If you do this for the first time, please keep an eye on the color of the nuts; every oven has it own settings, temperatures and not the same and heating times may differ. Cool beet and potato until you can handle them and peel them. Allow them to cool a little further and push them through a potato ricer. Sprinkle 1/4 cup of flour on your kitchen counter or cutting board and transfer the beet/potatoe mix on top of this. Add a dash of salt and pepper, add the poppy seeds and knead together. Add the rest of the flour and knead into a pliable dough. You may need more flour, depending on the size of the beet and potato. Don't overwork the dough. Roll the potato dough into a rope of about max. 1/2 inch thick and cut the rope in small pieces. Roll them into gnocchi. You can use a fork to get the traditional ridges, but you can do without as well (as I did). Place the gnocchi on a baking sheet with parchment paper. Bring water and salt to a boil and add the gnocchi to that boiling water. Small number at a time.Cook the gnocchi until they float to the surface. Make sure the water boils gently. 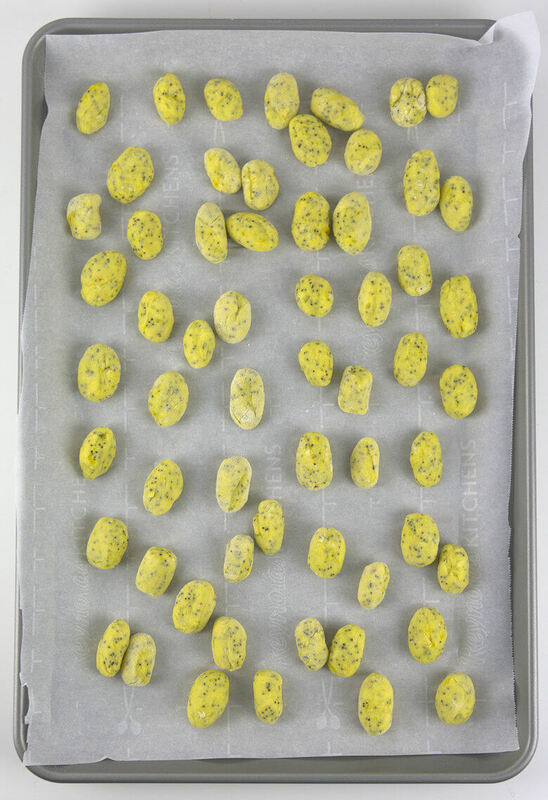 Remove the gnocchi with a slotted spoon and place them on a second baking sheet with parchment paper. Meanwhile, place a skillet over medium heat and add the bacon and cook until crispy. Transfer the bacon to a paper towel and drain. Crumble the bacon. Transfer the gnocchi to the bacon skillet and bake quickly on high temperature. Just to get a little additional flavor to the potato. Transfer half the spinach into a bowl, add the gnocchi. Transfer the other half of the spinach to the skillet, while still hot and 'bake' the spinach for just a minute until slightly wilted. Transfer to salad bowl. Add bacon, cherries and pine nuts. Mix and serve.